Sushi doesn’t means raw fish here. Absolutely not! We are making contemporary sushi – Alberta style. This class will teach you the fundamental techniques of making sushi, cooking and seasoning the rice, but with an array of local ingredients that will spark the artistic side within you, and keeping you rolling! On the menu: Braised pulled pork rolls, creative salads and grilled vegetables, personalized array of nigiri and original dips. You will also have a chance to put your own twist on some sweet spoons of black rice with choices of caramelized exotic fruits blowtorched "minute" garnish with crispy lemongrass coconut meringue. The experience is yours to create! 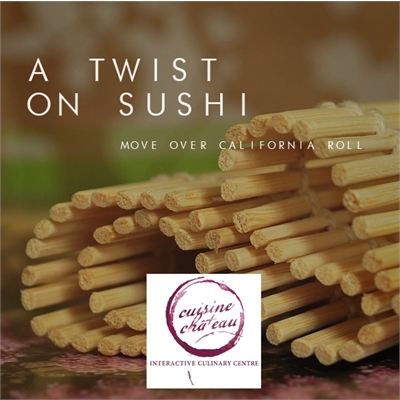 This class includes a recipe booklet, a sushi style dinner with wine sampling, and your own sushi mat to take home! How do I get to the culinary centre and where can I park?